This past Thursday, I met with a small group of Latinas at the National Museum of American History. These women had diverse educational backgrounds and were all in D.C. this summer for various reasons. 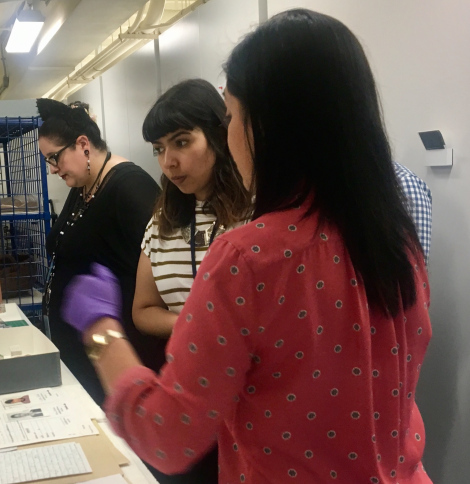 There were doctoral students, Smithsonian employees, interns, and of course, the lead curator of our private behind the scenes tour, Dr. Mireya Loza. Thanks to Smithsonian SITES Latino Pilot Project Coordinator, Patty Arteaga, a small group tour was organized with American History’s newest curators, Dr. Mireya Loza. I got to the museum early and found Fernanda (of NMAI) already inside and was able to have a quick discussion on the problematic unpaid internships that run rampant in museums. Just a few minutes longer and the rest of the group would join us. I was introduced to some new faces, Latinas who are doing remarkable work in the museum field already. We were escorted upstairs to the staff floor to meet with Dr. Loza and followed her into a collections storage room. Laid out on a table were items pulled especially for our small group, a selection focused on Latino themes, pieces she helped bring to the museum. In order to respect the curator’s ongoing work and the internal policies of the museum, I cannot share specifics but what I can share is that this was a particularly special moment for me, despite not being able to personally connect with the objects carefully laid out on the table. Be more knowledgeable about our own complete American history. Recognize how absent history changes the narrative we’ve been taught. Re-examine current issues with a proper understanding of our historical past. Like I had mentioned before, where Latin and US history melds into a single story centers around Mexico-US relations, naturally. So then it should go without saying that this part of history and the effects afterwards should be well included in the curriculum, as much as any other part of American history. But I can tell you right now that the disconnect I felt in the collections storage room that day was mostly in part because I do not know Chicano history at all. I can tell you far more about the Civil Rights Movement, the important figures in that era, and the events that lead us all the way to the 80s, 90s and so on. I can tell you all about the Civil War, WWI and WII. Is it because I live in the east coast? Is it because I was born and raised in the DMV? Is it because that part of history is considered more important? Is it more important? Or is it because learning institutions decided for me and others early on what part of history would be prioritized and what wouldn’t? There are so many questions one could ask but the most important one of all should be why isn’t Latino history, as it intersects with US history, presented more often? I briefly learned about the Mexican-American War in high school and know the names Cesar Chavez and Dolores Huerta thanks in part to sites that focus on Latino culture geared towards Millennials, like Remezcla. Outside of that, I know not much else. I asked many other friends from the area who grew up with me about the extent of their knowledge of US history as it relates to Latino-centered historical events and people. The empty responses and blank faces I got far outnumbered the responses affirming any kind of knowledge on important Latino figures. Mostly, the Latinos I spoke with (of Colombian, Salvadorian, Venezuelan, and Cuban background) may have heard of names like Dolores Huerta but do not know the history of the civil rights movement she helped shape in the west for labor workers. My other non-Latino friends basically had no idea (and also before I get sass, these are all intelligent men and women who work in tech, business, and finance). Something told me this was a coastal issue as the few west coast friends I had could tell me much more. But coastal differences aside, this was still US history and I felt I should know it. We need diversity in all levels…that’s exactly how you build a community…so that folks like me can feel supported and we can support others. I don’t know where my career in the museum field will take me, but what I do know is that there is plenty of room for growth and I would like to learn more about these less observed histories and see them presented in our museums as part of the overall timeline of our country’s development for all to learn from. Featured Image via Condé Nast Traveler.